I’m fairly convinced that you can pumpkin spice up pretty much anything if you put your mind to it. 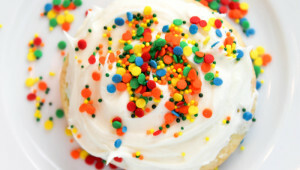 And that’s what I’ve been doing, to every baked good idea that comes to mind. 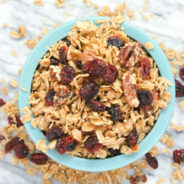 Donuts, cookies, muffins, cakes, pies, and now granola! 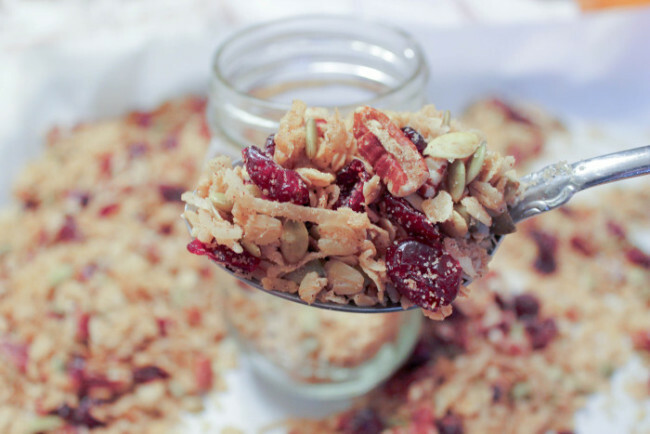 This granola is sweet, crunchy, nutty and pretty much the best thing you’ll ever eat. I adapted my go-to granola recipe to swap in dried cranberries, pecans, and pumpkin pie spice to jam pack as many fall flavors in as possible. And while this granola is delicious served over yogurt in the morning or a scoop of ice cream at night, no one will judge you if you just start taking spoonfuls to the face after first bite. 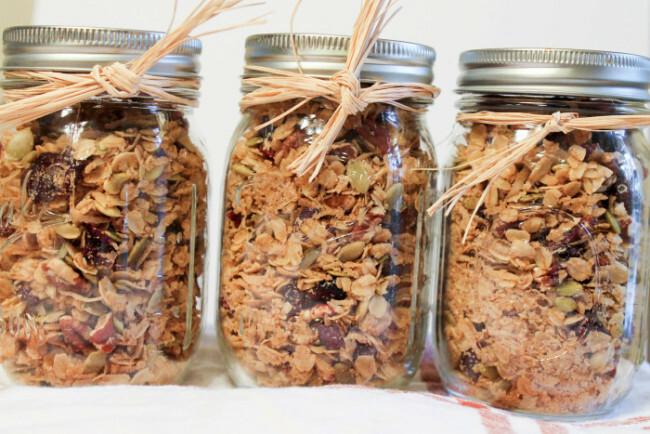 I first discovered the most amazing granola recipe through a friend who is an executive sous chef at a fancy shmancy NYC restaurant and brought some jars to the Cape as bachelorette favors. I’m not ashamed to say I ate the entire mason jar in less than 24 hours. Literally. The entire thing. And if you took one bite of it, you would completely understand the addiction. Now, I have sworn to keep that original granola recipe a secret, so you won’t see that posted here. But, I found a very similar recipe for the Eleven Madison Park Granola from the NY Times that had a very similar approach (likely because it’s from the same Chef), so I decided to take a few liberties to pumpkin spice this bad boy up. First, let’s just talk about how easy it is to make your own granola and how you should never buy store bought granola ever again. It is SO easy and SO delicious, and you can never go wrong when you know every ingredient that goes into the food you’re eating. Plus it’s easy to adapt the recipe to your own liking. In less than an hour, you’ll have a giant batch of fresh delicious granola at your fingertips.The only bad part about making your own granola is testing the limits of self control as to whether or not you can keep yourself from eating the 6 cups it yields by yourself in less than a day. I’ve found packaging up a few mason jars of the good stuff and giving it as gifts to friends helps me just keep one jar to myself. The secret ingredient to making the perfect granola is olive oil, which was unexpected but helps to give the granola it’s delicious crunch. To pumpkinfy this recipe, I coat the oats with pumpkin pie spice, and used cranberries, shelled pumpkin seeds and pecans, which pair really well with the maple syrup. 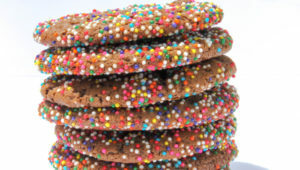 Brown sugar adds the perfect sweetness and is complimented nicely with the flakes of sea salt. 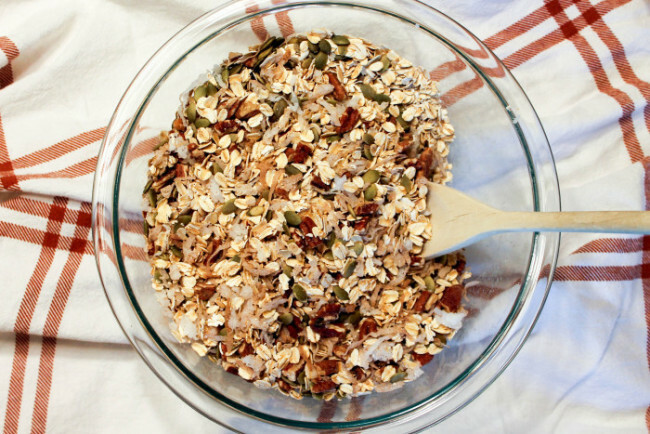 If you are already a pumpkin pie spice addict or looking for some gateway granola, this recipe is definitely one you need to try this fall. Step 1: Preheat the oven to 325 degrees. Line a baking sheet with parchment paper and spray with nonstick spray. Step 2: In a large bowl mix together the oats, pumpkin pie spice, coconut flakes, shelled pumpkin seeds pecans and sea salt. Step 3: Over low heat, gently whisk the sugar, maple syrup, and olive oil in a small saucepan just until the sugar has dissolved. Pour the liquid onto the oat mixture using a spatula to evenly coat the dry ingredients. Step 4: Spread the granola over the prepared cookie sheet and bake at 325 degrees for about 30 minutes until the granola is dry, stirring with a spatula a few times to ensure it bakes evenly. Step 5: Allow to cool before storing in an air-tight container or mason jar. 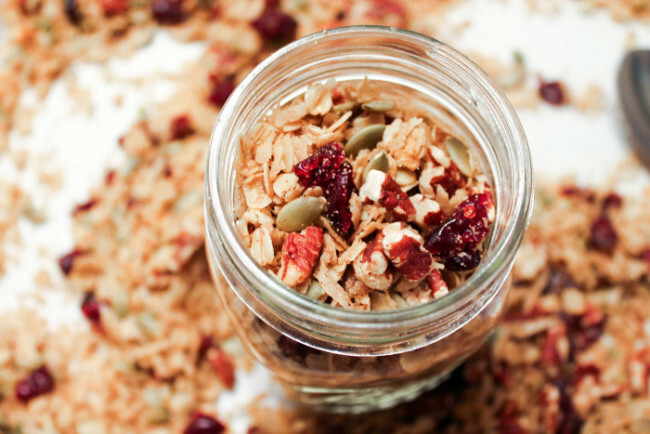 As much as I love enjoying this granola over some fresh greek yogurt, it’s equally as delicious straight from the jar. Farm to table, spoon to mouth. I’ve stocked up on mason jars so that I have them handy whenever I bake up a new batch of granola so I can tie some raffia around the lid and send my friends off with these goodies. It stays fresh for about two weeks refrigerated. 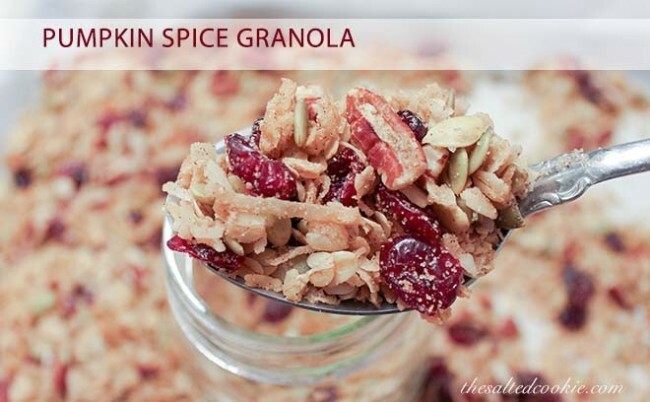 I’m already starting to think about new variations of this granola. I think there could be a gingerbread flavored one for the Christmas holiday, or maybe a peanut butter variation, or even s’mores granola?! 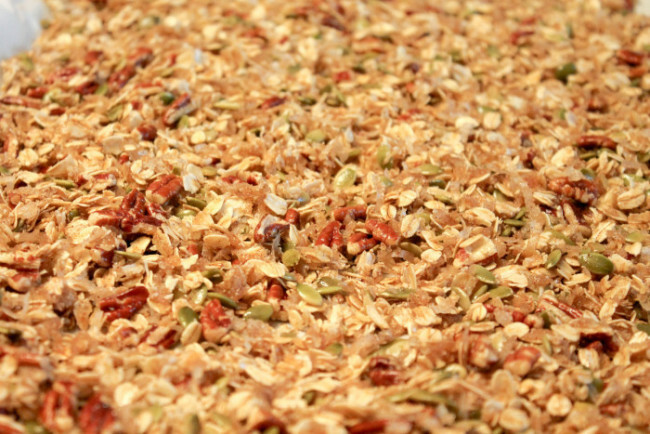 What other flavors of granola would you like to taste? Preheat the oven to 325 degrees. Line a baking sheet with parchment paper and spray with nonstick spray. 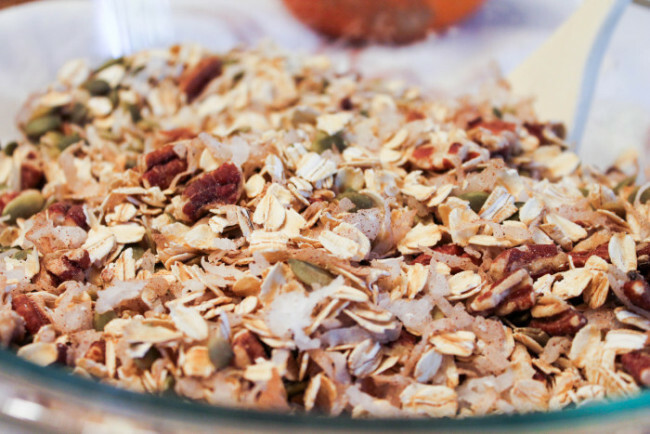 In a large bowl mix together the oats, pumpkin pie spice, coconut flakes, shelled pumpkin seeds pecans and sea salt. Over low heat, gently whisk the sugar, maple syrup, and olive oil in a small saucepan just until the sugar has dissolved. Pour the liquid into the oat mixture using a spatula to evenly coat the dry ingredients. 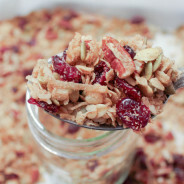 Spread the granola over the prepared cookie sheet and bake at 325 degrees for about 30 minutes until the granola is dry, stirring with a spatula a few times to ensure it bakes evenly. 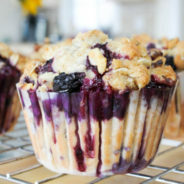 Allow to cool before storing in an air-tight container or mason jar.